Who can say no to a nice plate of risotto… I love it!! The key to a nice risotto, is a good broth (see my post about brodo). The broth defines the taste and quality of your risotto. A bad broth gives a bad taste, it’s that simple. You can always try using the broth cubes that you buy in your supermarket, but if you have the choice, choose wisely… You also don’t need to put to many ingredients in your risotto, keep it simple. 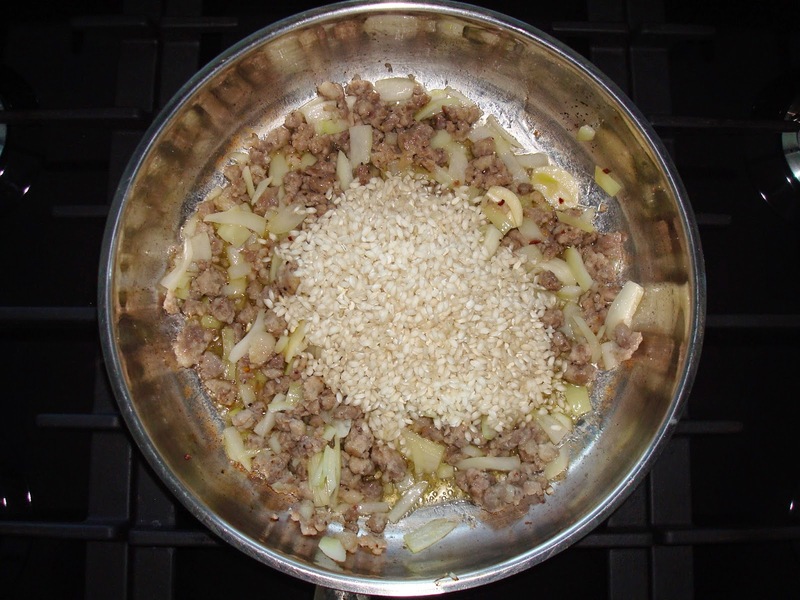 Now, why do i use Italian sausages minced pork? 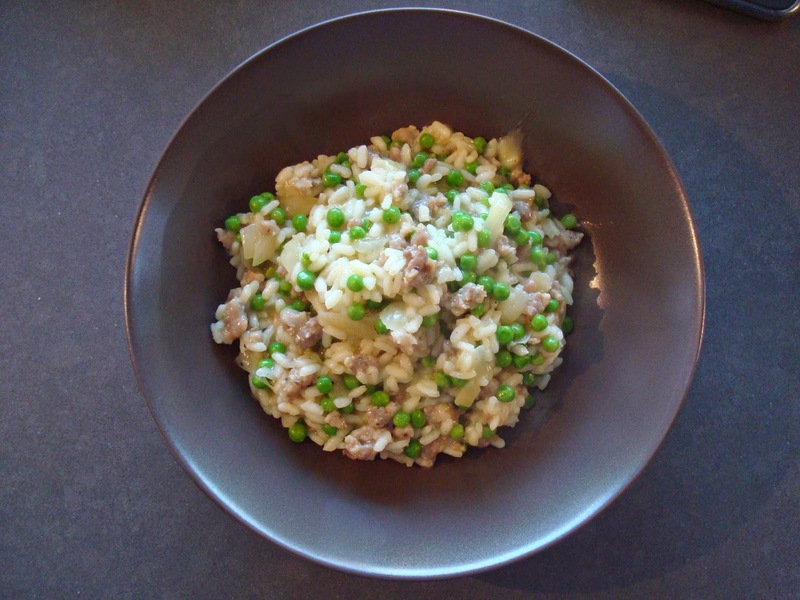 The answer is pretty simple: It’s grounded coarsely and seasoned and it also gives a better texture to the risotto. Let’s start making the risotto now. You take a low casserole and put some olive oil and butter in it. You heat it up until your butter is melted. Now it’s time to put in your meat. Once the meat has colored, you can put your onion, garlic and chilly flakes in it. Let it stove until your onion is some what transparent. Now you can throw in your rice. 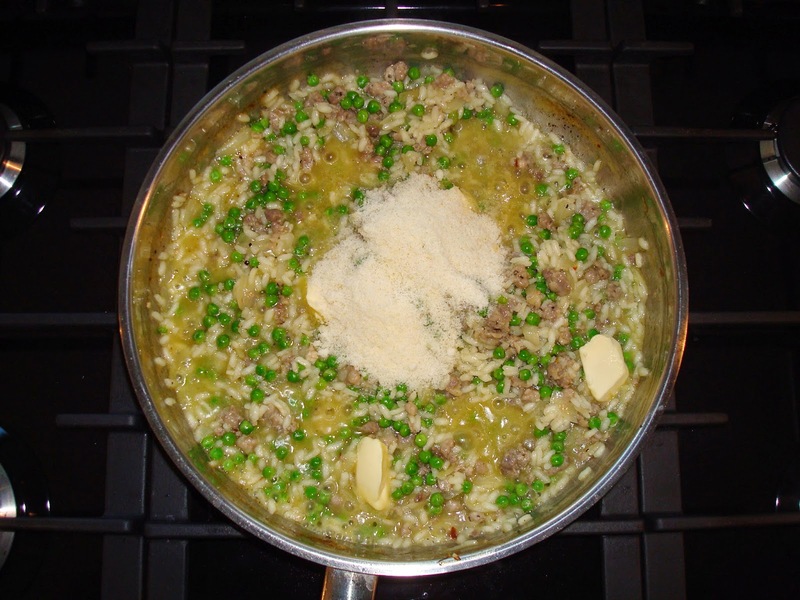 Leave the rice until it has absorbed all the butter and olive oil. Once it has, you can add your broth, just until you cover all your ingredients. The rice will now cook in your broth and absorb all the flavors from it. It will take about 15 minutes for your rice to be “al dente“. Keep tasting it because you need to add your peas at the perfect moment. Your rice has to be almost ready. When you’ve reached that point, you add your peas. Stir everything until you like the cooking time of your rice. Now before putting your risotto on a plate you’ll have to add some parmesan cheese and some butter. Just enough to make your rice stick together and make it more creamier. Keep stirring until the cheese and butter have dissolved, and then it’s ready to serve!! Next Next post: Spaghetti broccoli, fast and simple!